The homeobox gene DLX1 is known to be involved in the development and migration of GABAergic interneurons. Kromkamp et al Article have investigated the expression of DLX1 in the mediodorsal nucleus of the adult human postmortem thalamus using brain tissue from the Stanley Foundation and Neuropathology Consortium. The results suggest a shared genetic deficit in both schizophrenia and bipolar disorder patients in relation to a vulnerability to psychosis. Schizophrenia is characterized by small reductions in cortical gray matter volume but the question of whether the thickness of the cortical ribbon is reduced in schizophrenia has not been addressed using magnetic resonance imaging techniques. Kuperberg et al Article demonstrated that chronically ill, medicated patients with schizophrenia showed widespread cortical thinning that particularly affected the prefrontal and temporal cortices. This thinning might reflect underlying neuropathological abnormalities in cortical structure. A functional polymorphism in an exonic region of the COMT gene that encodes enzyme variants of differing activity is thought to have an effect on prefrontal dopamine signaling. In this study, Goldberg et al Article demonstrate that COMT genotype has a significant impact on a specific cognitive subprocess demanded by the N-Back test of working memory, namely "information updating." Effects were apparent across large samples of healthy subjects, schizophrenic patients, and the well siblings of patients, suggesting an additive genetic model. Katon and colleagues Article found that elderly patients with depressive symptoms that were below the DSM-IV diagnostic threshold or those with major depression or dysthymia had 47% to 56% greater total health care costs than the nondepressed, even when controlling for medical comorbidity. This increase was seen in every component of health care costs with only a small percentage due to mental health treatment. Miklowitz et al Article examined the efficacy of a 9-month family-focused psychoeducational treatment (FFT) and mood-stabilizing medications for 101 bipolar I patients who began in an illness episode. In a randomized controlled trial, patients receiving FFT and medications had significantly longer intervals without relapsing, greater reduction in mood disorder symptoms, and better drug adherence over 2 years than patients receiving a less intensive psychoeducational intervention and medications. Rapid cycling in bipolar illness has important implications for treatment selection and prognosis, yet little is known of the phenomenon's long-term course. 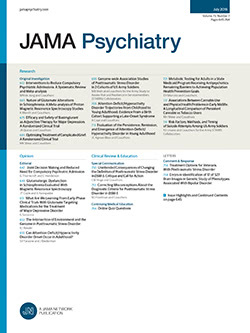 In a report from the National Institutes of Mental Health Collaborative Depression Study, Coryell et al Article found that 81 patients who developed rapid cycling during a follow-up of greater than 10 years were unlikely to sustain this pattern for as long as 2 years and that antidepressant use did not appear to provoke instability. MacKinnon et al Article examined the correlates of the phenomenon of rapid switching of mood states, using the diagnostic data from a collaborative genetic study of bipolar disorder. The 44% of individuals with bipolar disorder who had "switched back and forth quickly" had an earlier age at onset, more suicide attempts, more comorbidity, and were more likely to have a relative with rapid switching and to have had a hypomanic response to antidepressants. To explore how genetic and environmental risk factors contribute to patterns of comorbidity of common psychiatric and substance use syndromes, Kendler et al Article applied multivariate modeling to lifetime diagnoses for 10 psychiatric and substance use syndromes in male-male and female-female twin pairs. Genetic risk factors predisposed to 2 groups of internalizing and externalizing disorders. Within internalizing disorders, 2 correlated genetic factors predisposed to disorders dominated, respectively, by anxious-misery and fear. Substance use disorders have disorder-specific genetic risks. The pattern of lifetime comorbidity of common psychiatric and substance use disorders results largely from the effects of genetic risk factors. Rosenheck et al Article report results from an experimental cost-effectiveness study of supported housing for homeless people with mental illness. This program combined Veterans Affairs intensive case management with Housing and Urban Development Section 8 housing vouchers. During a 3-year follow-up period, experimental clients had 25% more nights housed, 36% fewer nights homeless, and larger social networks than a standard care group but there were no significant differences on clinical outcomes. Supported housing cost $45 more for each additional day housed.